The Willamette daisy (Erigeron decumbens var. decumbens) is an herbaceous perennial in the Asteraceae family that is endemic to Oregon’s Willamette Valley. Although it was once common throughout wet prairies and upland meadows in the region, habitat degradation and fragmentation has caused a severe decline in population numbers. There are currently fewer than 40 known populations of Willamette daisy in existence, a quarter of which cover less than one acre. This is concerning due to the loss of genetic diversity, which results in inbreeding depression within populations. The decline was severe enough to warrant protective listing by both state (Oregon Department of Agriculture) and federal (US Fish and Wildlife Service) agencies, as well as federal designation of critical habitat. The Willamette daisy can be identified by its tall, pink to purple flower and its slender, lanceolate leaves that turn glaucous in the spring. The genus name Erigeron is derived from the Latin words eri- (meaning early) and -geron (meaning old man). The name describes the grey-green coloring that the leaves develop in spring before the flowers bloom in June and July. In its vegetative state, E. decumbens can be confused with Plantago sp. but can be correctly identified by the three parallel veins running up the leaves. The Institute for Applied Ecology has undertaken several experiments to identify the threats to the populations, as well as management techniques and reintroduction methods that could prove beneficial to species recovery. Recovery prospects are poor without intervention, so it is important to establish effective reintroduction and management strategies. IAE initiated experiments in 1999 focusing on determining ideal habitats for reintroduction efforts. Seeds were collected from populations in both wet and dry habitats and redistributed in experimental plots that were classified as wet, intermediate, and dry habitat. Seeds from both source habitats fared equally in the introduction plots, indicating that there isn’t a specific habitat type that would be more suitable than others for seeding projects. Another round of experiments is currently being conducted to determine the best management practices for E. decumbens populations. Threats that must be managed include encroachment of shrubby and woody species and invasion by non-native forbs and grasses. Initial experiments tested the effects of the common management activities of mowing, grazing, and burning, but in 2011 additional treatment plots were created to test other options such as carbon addition (pouring sugar on plots), use of grass specific herbicide, and application of glyphosate. An additional set of treatment plots has been established this year to increase data collection locations. 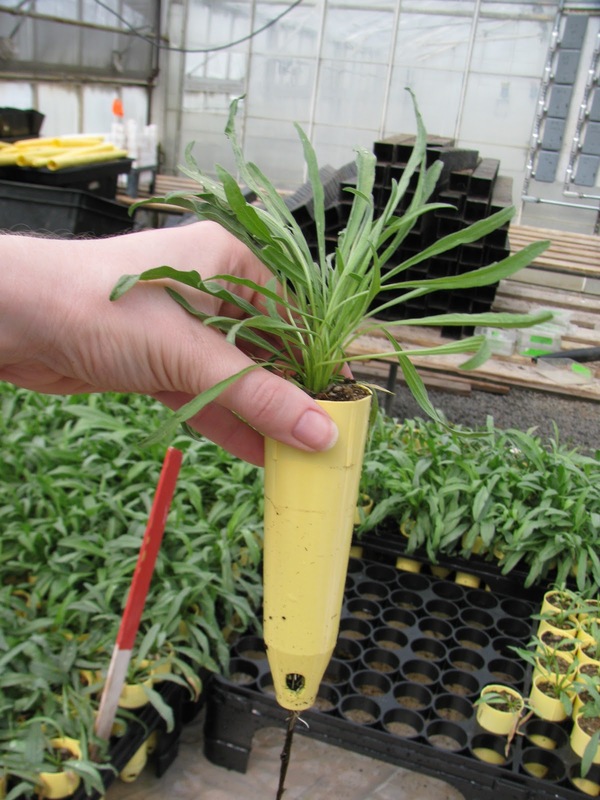 IAE has grown over 1800 E. decumbens individuals that will be outplanted this month. Propagation of this species required allowing 16 weeks of cold stratification in germination boxes, followed by one week in greenhouse conditions before the seeds were carefully transplanted into containers and tended to in the greenhouse for several months. Although the process is intensive, IAE has been very successful at growing robust plants for use in experiments.